For all of my readers who have been with me for over a year (all 5 of you), congratulations! You have the day off. It is Spring Break, after all. For all of my new bloggy friends, what I am about to share with you may forever change the way you view your lunch. And I do not say that lightly. I waxed poetic about this sandwich exactly one year ago, on my old blog, but it really does bear repeating. This is my favorite lunch in the entire world. I almost always eat it weekly and I often eat it for days on end, yet I never tire of it. 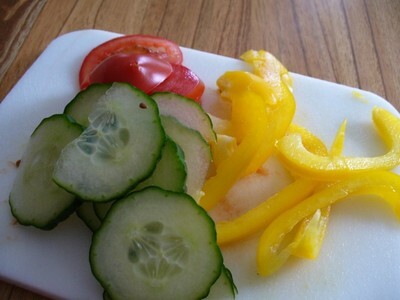 It affords me the soul-soothing pleasure of chopping up some vegetables and it's very healthy. I get so excited to sink my teeth into that first bite. 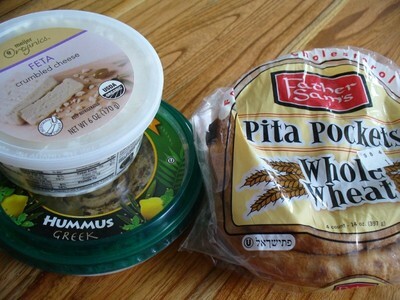 It's very important to use the specific pita bread and hummus shown. While some pita bread is akin to cardboard, Father Sam's is thick and soft. (And warm, since I toast mine first.) Plus, half a piece has 3 grams of fiber. For some reason, I'm all about checking the fiber content these days. I guess Dr. Oz finally won me over, or something. Use whatever feta you like. I always buy the plain, unseasoned kind - whichever variety happens to be cheapest. Note: Several people have asked where to find this pita bread. It hides in the strangest place! You can find it at Meijer, directly in front of the Deli counter. It's on a weird metal shelf that is only knee-high. Who knows! I'm warning you, the pita fills up fast, just like the old taco phenomenon. But do your best to cram in as much as you can. Final thoughts: One is usually enough, but two is even better. This absolutely makes my list of things that make my life happier and lovelier. Check out The Inspired Room today to see a whole slew of things that make people smile. I think I know what I'm having for lunch! The avocado is a great addition. This little pita makes my heart smile for two reasons. 2. I love this pita, it's delish! Yummy! that looks great! I love pitas, I usually just stuff a salad in there, but I like idea of adding feta! Well now, I love pita bread, but I am not good with raw crunchy veggies. That whole salad phenomenon never worked for me either. Not sure where I have been for so long...let me go visit the rest of your blog. Hope you have a wonderful Easter! Oh Yum! Have a glorious Easter weekend! This sounds so interesting to me. I'm putting it on my try list. I'm also a big believer in the fiber content but I've yet to figure out just how much we are supposed to have. Yummy, I'm so going to try that. I'm always looking for a great new sandwich. Thanks for sharing. I hope its not too late to get some while the getting is good. my taste buds are never the same no matter how simple or complex the meal you serve. I have been sold since the first time you served it to me! This looks delicious. I have to look for those pitas... I have never found a pita that I liked, but you have inspired me to keep looking. Can't wait to try it, looks so delish! Hope I can find the pita all the way here in Seattle. Keep the recipes commin!